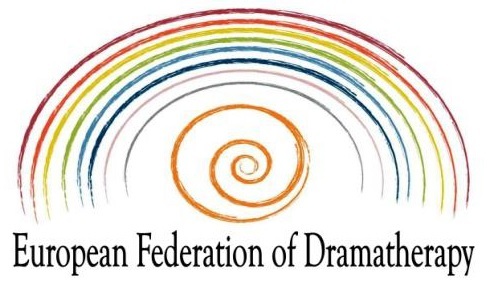 Thank you very much for attending the EFD conference: 'Setting the stage'. We hope you have had a thought provoking and enjoyable weekend. We would really appreciate if you could fill in this feedback form and return it to us as soon as possible, to help us organise another successful conference next year. + What is the state of the Dramatherapy- scene in your country? + How is Dramatherapy applied in different fields? + Have specific approaches been developed in particular countries/ cultures and why? 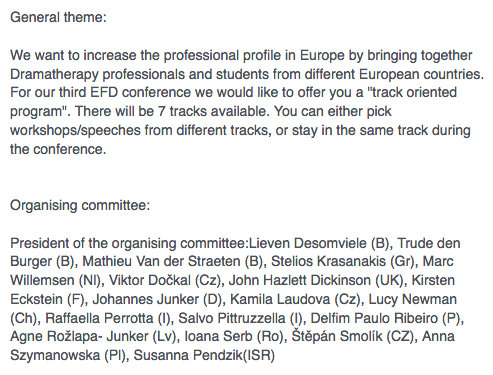 + What are the main transformative factors in dramatherapy, according to the approach of the speaker? minutes open discussion). We give you the possibility to submit your proposal in 2 formats: a written one or a video. The deadline for submissions is January 14 2017.